Immediately after IW central court saw the last players walking off from the stadium, the lights turned on in the courts of Key Biscane, where another premier Mandatory took place in the two weeks that preceded Easter. The tournament had no time to start that a sudden news already changed the equilibrium of the draw as seed number 2 and two times AO champion Vika Azarenka withdrew, making the bottom half of the draw looking far more open to surprises. Surprises indeed happened already in the early rounds with quite a few lower seeds falling in their first matches in the second round and higher ones one step further as Indian Wells's finalist Caroline Wozniacki lost to Spanish youngster Garbine Muguruza, Angie Kerber defeated by Sorana Cirstea and Petra Kvitova out by the hand of Belgian Kristen Flipkens. At her comeback after the walk over given in Dubai and the skipped even of Indian Wells, Serena Williams played Italian Flavia Pennetta. The former doubles' world n°1 and singles top tenner gave Serena a nice match to start with since the double 6-1 in favor of the American doesn't reflect the hardly fought match, with every game going to deuce. Serena seemed to struggle a little more in the following days as no-one of her wins seemed to convince she was sure of a deep run, but despite the lapses and several awkward sets, the world number one and top seed kept winning matches reaching her QF against Li by finding a way out from a set and a break down to Cibulkova in R4. whose quality won't be remembered as the best those two could produce. Quality wasn't the trademark of the defending champion neither, as Agnieska Radwanska played far from her standards in R4, before finding back some of her all-round solid game to outlast Sloane Stephens in three sets and then again in the QF to come back from a set down to Flipkens. The Chinese reached that point without showing much of her best tennis neither, at her comeback after the Australian Open Li Na looked quite on shape, but still rusty in her game and not fully focused, as her win over Muguruza showed as she needed thousands chances before closing the first set which twice looked fully on her hands (5-2 up and service and later 6-2 up in the tie break). surrendering in the second set. Here in Miami things moved on quite differently, as Maria looked a lot more dominant in the first set, to eventually be broken when serving for the set and be forced to get a vital break at 5-all in order to be able to close the first 7-5 for her. In the second set, though, Sarita didn't give up and tried for new ways to break Masha's game and she found a few of them, which lead to 3 set points, all of them cleared by Maria's powerful hitting, the same which eventually will let her close the match in straights, 7-5 7-5. In the last QF clash held in the night of Miami Italian Roberta Vinci and her old-styled game was facing the former world number 1 Jelena Jankovic from Serbia, who's game looked as good as rarely in the past years before this match. The two fought one of the most entertaining and instense, as well as high qualitative, matches of the tournament, a battle of around 3 hours after which the Serbian could get out of the stadium with a 6-4 6-7 6-3 win. As much as the quarter finals were intensively fought, the semifinals went on fast and without many "coups de théâtr"as in two very fast sets Serena dispatched Aga Radwanska 6-0 6-3, whilst Sharapova let Jankovic win the same amount of games in their 6-2 6-1 match. Leading towards the final the interest about the match was great nonetheless, as this match withing current world number 1 and 2 had a lot more to offer than the "simple" title: for Serena a win here, would have meant the 6th title, for Maria the 1st after four finals reached and lost in Key Biscane. Moreover the two were facing for the 14th time and Serena was leading the H2H for 11-2, where the latest win of the Russian is dated 2004 and in their last meetings nothing could suggest a chance for Maria to start winning again against Serena. The form showed in the past weeks was a great burst of confidence for Masha though and it played an important role at the very beginning of the match, when the Russian immediately took the lead pushing hard on the throttle, hitting solid and powerful groundstrokes, which at first disoriented Serena, whose serve didn't live up her usual performances and so the return. Maria took the first set 6 games to 4, but the lead didn't seem to help building enough confidence to keep her aggressive play going. On the other hand the younger Williams started the 2nd set looking far more focused and ready to battle past the heavy shots of the Russian. The fight lasted but a few games, very competitive ones, where both girls tackled for each point as if it was a match point. In the end it was Serena coming out with the brightest solutions and most extraordinary shots, which let her take the second set and start the 3rd in full-confidence. On the other side of the net Sharapova looked suddenly lost and with no answers for this unexpected switch in the momentum of the match. 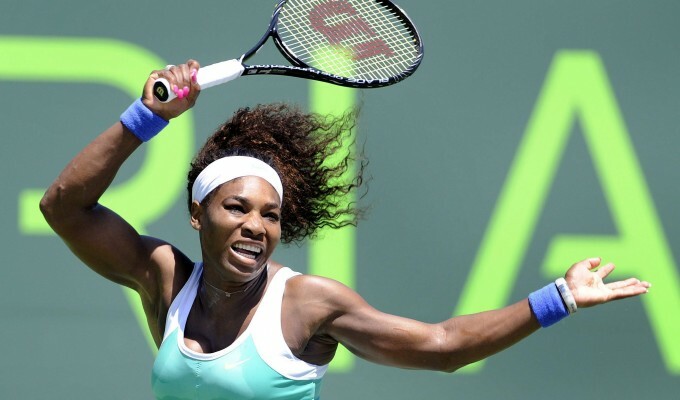 Before she could even try to work a way out it was over, 6 games to 0 for Serena. Game, set and match Williams 4-6 6-3 6-0, 6th titles for her, 5th final loss in Miami for Maria and 11th consecutive loss against Serena. Nice work. Great writing. And THANK YOU for taking the time to find good pictures!